MIO-ECSDE participated in the Union for the Mediterranean (UfM) Climate Change Expert Group (CCEG) meeting that took place in Barcelona on 23-25 April 2018, represented by Jeremie Fosse, president of eco union and MIO-ECSDE board member. Discussions focused on several issues of concern for the Mediterranean region such as climate finance, which will identify, develop, and scale new financial tools for a low carbon, climate-resilient transition. 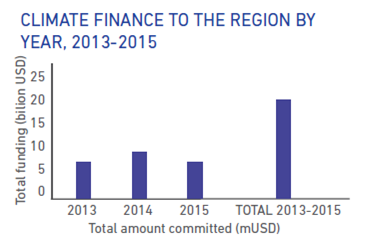 The UfM Climate Finance Study was presented which reveals that the Southern and Eastern countries of the Mediterranean region have received USD 6.8 billion in climate financing per year between 2013 and 2015, according to OECD, which represents from 11% to 16% of the worldwide funding for climate finance. It shows that there is a window of opportunities for an enhanced and coordinated regional action, notably through the promotion of region-wide projects focused on climate change adaptation and the active involvement of the private sector. Two more sectoral reports on Tourism and Agriculture (under preparation) in the Southern-Eastern Mediterranean countries were also presented. For more information about the CCEG meeting, read here. Although there is a UfM REEE Platform (Renewable Energy and Energy Efficiency Platform) that aims to promote the progressive deployment of renewable energy and energy efficiency measures, of concern to MIO-ECSDE is the promotion of natural gas under the UfM energy agenda and the dedicated UfM Gas Platform. The Secretariat needs to explore the matter further.